001. Old friends! To some of you who may have read my blog in the past, remember Puff, my little site mascot? Despite moving house, and her head falling off, she remains in tact – I’m still smitten, haha. 002. Admittedly, this Cadbury’s Flake advert doesn’t really spell out ‘chocolate’ in my book… however, there is definitely a ‘fashion moment’ happening, in the form of one hell of a hypnotic tentacle-like-jellyfish-y dress. Its enough to keep me quiet for a minute or so! Also, just imagine the fun you could have with that in a photoshoot. Note: Turn your sound on for full hypnotic-effect! 003. Barry M Nail Paints in Mint Green and Cyan Blue. Delish! 004. 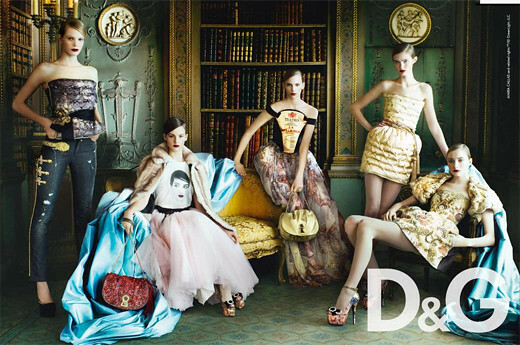 D&G A/W 2009 remains the perfect collection in my eyes… I would do anything to open my wardrobe to this everyday! 005. 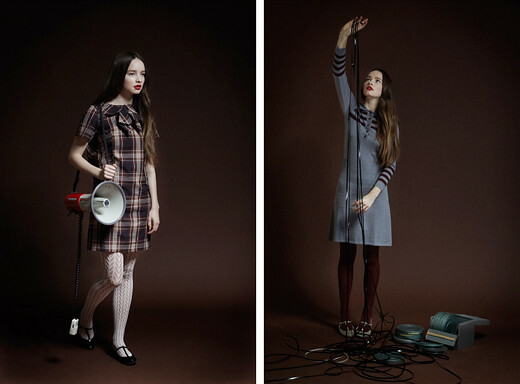 Vested Bee Vintage, run by the gorgeous Fabiola, a real gem if you’re into vintage. And, might I add, she pulls off the girl of yester-year style flawlessly! 006. LOVE magazine, which is now also online, yay! Pick your cover carefully girls, there are eight bombshells to choose from. No contest for me, Team Rosie all the way! 007. One of the first ever ‘fashion’ blogs I read religiously, was the wonderful Gala Darling. The ‘feel good factor’ is second to none, I promise you now that a day with Ms Darling in your life will never be a miserable one – check her out if you haven’t already, she’s an angel! 008. Despite it being Sunday seven I’m making an exception for one of my bestest most lovelist friends, Carrie! I’m sure by now, you will be familiar with her blog – she’s the one who introduced me to the whole new world of the blogosphere, and has done rather well for herself from it – I feel like a proud parent, haha. Without the inconvenience of rain and/or work keeping me shut up inside, I was finally able to go out in the garden and get some much needed sunshine : ) I was inspired by this Marc by Marc Jacobs S/S 2008 dress, and this beautiful, romantic creation from the Mulberry A/W 2008 collection, to go with this palette of red and cream. Nice and summery, don’t you think? With the dark nights slowly creeping back in, and rain clouds making regular appearances overhead, I need no more reminding that winter is looming once again. Although Autumn/Winter collections are always my favourites – with the spice, jewel and rich, regal tones always making their way back onto the runway, some of the concoctions are simply divine. Unfortunately though, I have never been one to find dressing for the cold months particularly easy, and feel its time for a little ‘self help’! Despite magazines (and all of you lovely bloggers of course!) presenting perfect winter wrap-up-warm solutions, I still feel a little lost as to how to beat the big freeze whilst remaining chic! Which is why I fell in love with the Dear Creatures A/W 2010 collection, which combines all of the elements necessary to create a non-bulky winter look. What I crave the most for this upcoming winter is a simple selection of long sleeved dresses (love the cream polka dotted number!) chunky cable knit tights, and the perfect navy blue coat to top off any outfit with! Which pretty much makes this my perfect winter selection. Also, any brand that manages to make untangling wires look chic, and the carrying of a megaphone instead of a handbag appear normal… gives me hope that perhaps if I were to become a ‘Dear Creature’, myself, I might just be able to pull off my every day activities, whilst being sliced in half by a fierce winter gale, in a way which is just a little more chic than usual! What more could I want? Let’s hope this winter will turn out to be one full of elegance, huh? Wish me luck! I’m still on my quest to find my perfect match! Whilst I absolutely adore the cherry hue of this particular Revlon creation, I find that it simply lacks the staying power I need to see me through a day or night out – I’m not the type to want to retouch my make up at regular points throughout the day. 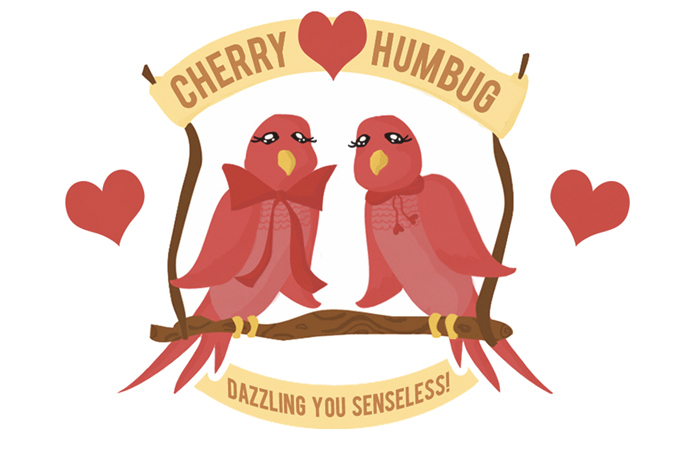 But all things considered, I have found that my trusty Cherries in the Snow has outlasted other more expensive brands, and with such wonderful imagery linked with the name, who am I to resist? So for now, perhaps I should consider investing in some Lipcote, I’m sure many a femme fatale from the 40’s would’ve benefeitted from such things! P.S More polka dots?! 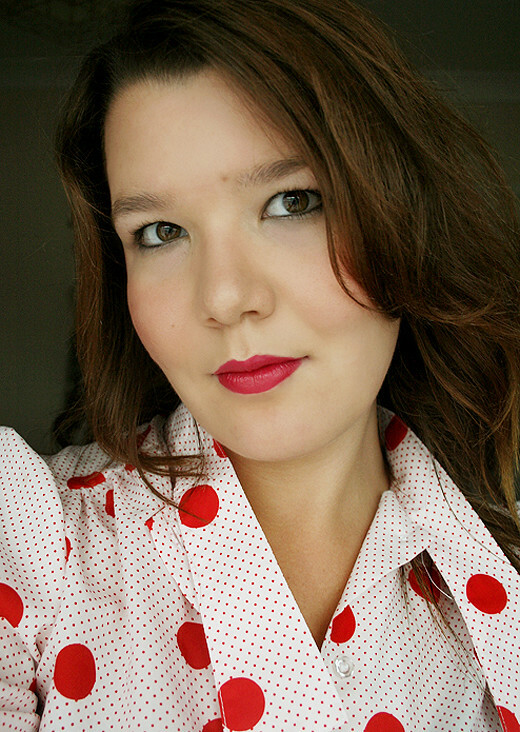 I never realised before how many polka dotted pieces lurk in my wardrobe. This particular shirt was found in a charity shop, one of my best finds… although technically my mum spotted it, she does come in handy – thanks mum! P.P.S I have a new Twitter account! 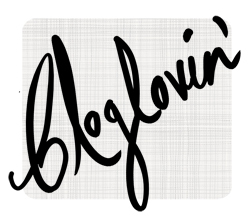 I’ll be using it to keep up with all of your blogs and whatnot, so if you’d like me to follow you – add me so I can return the favour : ) You can find a link to my profile in the sidebar! One rainy day last month, I went out shopping to Taunton for a change – a place I rarely ever go to, and ended up bagging myself a few bargains. One of said bargains was this spotted number from Topshop, which since, I have quite fallen in love with! I have become a bit lazy lately, which I’m going to put down to working in the mornings; when I get home I want to throw something on quickly – hence why I love the below playsuit, and this dress too! Little did I know, that the dress I’d picked up for £12 from the sale rail was causing a bit of a stir online (thanks to my reliable source Carrie for letting me know!) after Alexa Chung wore the same one during promotion for ‘Frock Me’, and going for around £50 on eBay. Crazy stuff! Just goes to show, that if you want something to sell out – bring in Ms Chung! Haha. I don’t think I can bare to part with the dress, even for a nice tidy profit, because I feel it’s going to be a saviour throughout the winter months thanks to the long sleeves – I’m not a huge fan of layering on mounds of clothing, I feel like I often appear to have expanded 2-3 dress sizes in past attempts at layering… so this will come in perfect when the weather turns colder : ) and as for now, love love love it! I’ve spent such a long time trying to find myself the perfect playsuit. Having tried on many that were either 1. too short in the body 2. too skimpy or 3. simply too expensive, I was about to give up when I stumbled across this polka-dotted beauty on ASOS, I knew I had to have it – and in the sale too, what could be better?! It’s the perfect fit for me, and comfortable enough that I feel I can wear it on a day-to-day basis without it seeming too ‘dressy’. It has really become a failsafe piece in my wardrobe, with many summer days spend deliberating over what to put with what… I have found something that I can rely on whatever my mood! This may be the start of something… haha.